Preparing for emergencies can be tough because they happen out of nowhere and have to be taken care of immediately. Having a plan for what you can do in case of an dental emergency may just make the difference between keeping or losing a tooth. If you as a parent or guardian are prepared and stay calm so will your children or those you are caring for. We have some basic steps that will help you to be prepared in case of a dental emergency. 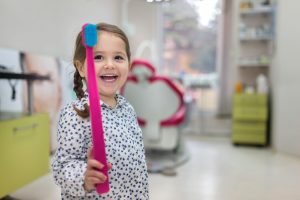 The first step in being prepared for a dental emergency is to have a pediatric dentist office you can call home. Whether it’s a dental injury on the playground or at home, having a place you can call and be comfortable with is a good start. At Hines Little Smiles, we can be your dental home. We will help you feel cared for and supported during these emergencies if they ever come up. ● When a baby tooth is knocked out – Contact us immediately. Do not try and replant it, this could do damage to permanent teeth. ● When a permanent tooth is knocked out – Find it and carefully rinse the tooth with cool water. Do not use soap or try to scrub it. Next replace the tooth in the socket and hold it there with gauze or a clean washcloth. If doing this is not an option put the tooth in clean cup of milk, saliva or cool water. Contact our office immediately. The faster the treatment, the greater likelihood you have of saving the tooth. ● When you have a damaged or chipped tooth – Contact us immediately. Find any tooth fragments and place them into cold milk or water. Rinse the mouth with water and apply a cold compress to to reduce swelling (in the lip was injured). Prompt treatment is so important for preventing any infection and avoiding potential complications. Planning for a dental emergency doesn’t need to be scary. With the right knowledge and preparation there is no need to worry. We at Hines Little Smiles are always here to help and are ready for your emergency calls. We can answer any questions you may have. Contact us today!